Our Escape to San Diego Sweepstakes is in full swing. We are giving away a 5 night stay at the Hilton San Diego Bayfront Hotel and round-trip airfare for two! Contest ends May 13, 2011, so be sure to enter today. How would you spend your five days in San Diego? Last week I highlighted our amazing beaches and outdoors. Sure we have an average year-round temperature of 70 degrees and over 70 miles of beaches, but there is so much more to explore. Today I’m highlighting the perfect Urban Escape. The Hilton San Diego Bayfront Hotel is the perfect setting for your Urban Escape. Located downtown, with a new pedestrian bridge connecting you to the Gaslamp Quarter, the hotel is an urban oasis with a spectacular waterfront setting. 1. One of my favorite areas of downtown is Little Italy. Once home to San Diego’s flourishing tuna fishing industry and generations of Italian families who made their living on the sea, Little Italy is a quaint and lively neighborhood filled with patio cafes, restaurants, pubs, art galleries, shops, hotels, and the beautiful Amici Park. 2. One evening, head to the neighborhood of North Park for a night of bar-hopping. 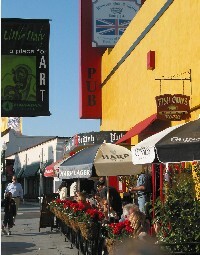 North Park’s nightlife comes alive at the intersection of University and 30th Street. My go to spot in North Park is usually Urban Solace. The menu features a unique combination of American dishes, both classic and cutting edge, and an intriguing wine and crafted beer and cocktail list. 3. Learn how the now trendy Gaslamp Quarter once flourished as a red-light district on the Gaslamp Quarter Historical Foundation’s walking tour. You can either do a self-guided walking tour or join one of the guides as they take you back to the 1800’s and discover the haunts of famous former resident, Wyatt Earp. 4. 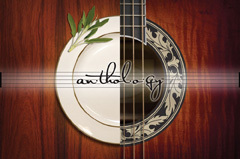 If you love live music, then Anthology should be on your hit list. Located in Little Italy, Anthology embraces the spirit of classic supper clubs from the 1940’s with a decidedly modern spin. Anthology draws renowned local and international musicians of jazz, classic rock, blues, Latin and more. 5. One of the most unique ways of seeing downtown is with GoCars. These cool yellow GPS guided scooters deliver an informative tour, pointing out places of interest along the way. I recently tried the downtown tour that takes you through Gaslamp Quarter and Balboa Park. We learned a lot and are blast to drive! This entry was posted in Attractions, Culinary, Insider Tips, Tours & Sightseeing and tagged contest, downtown, escape to san diego, fun, Gaslamp Quarter, gocars, hotels, little italy, live music, music, North Park, urban escape, urban solace, walking tour by Suzzanne. Bookmark the permalink. Ocean, Wine country, beautiful weather…the girl I worship lives there. Oh yes…I love San Diego. Would have loved to have lucked out and grew up there..but, NOOOOOOOOOOOOOOOOOOO had to grow up in Michigan. San Diego, has to be the greatest place to live, even with the occasional wild fire. That’s why God made water..to put it out.! Such a beautiful place for relaxation! Can’t wait to return – an escape would be so wonderful!! Lived in SD my whhole life, but there’s so much more to do here. I WANT TO WIN!!! I’m so homesick. Lived there all my life until 8 years ago. Miss it sooooo much! What ISN’T there to like about San Diego. Lived there and had to move away from it! What I wouldn’t give to vacation (at least) there now! Visited San Diego years ago and had a great time – what a beautiful city! What a place to have so much fun we really miss being able to just pop over the mountain from Arizona and have a blast. It is really a neat place and we miss it so much. I am a San Diego native, living near Chicago since 1982. Cubs? Sox? Bears? Bulls? I THINK NOT!! I am true to my hometown teams. Always have been, always will be. I Haven’t been home since my mom’s funeral Jan, 1991. I would love to visit and see all the wonderful changes and to get away from, even for a little bit, the hot, humid Illinois summers and brrrr snowy winters. I would do some sightseeing, tour balboa park and the zoo, hopefully catch a padres game and just enjoy the wonderful weather and the san diego bay. While stationed in the military in San Diego i’ve seen some great places. I’ve been gone for 4 years now and would love to go back and have some time to spend seeing parts of San Diego I never saw and my friends that are still there. I HAVE BEEN TO BORTH SAN DIEGO AND TIALY AND LOOK BOTH PLACES THAT HAVE GREAT PEOPLE AND GREAT FOOD AND OF COURSE YOU HAVE SUN SHINE. I LOOK FOREWARD TO SEEING CA IN THE NEAR FUTURE. I love San Diego so much that I want to move there someday and I live in Florida. My son’s live there. The Marines took them there. I love Gas Lamp Quarters, the food there is awesome. I also love Ocean Beach. Just a beautiful state all in all. I will save you the airfare! I am already here in beautiful San Diego.